What’s your journey that brought you to Insight Vision Center Optometry? I was born, raised, and educated on the Gold Coast of Australia. While continuing my education, at the age of thirteen I became a professional show water skier at Sea World of Australia. My profession allowed me to travel the world performing where I met my husband from Michigan. We settled in Australia to have a family and I continued my education, that is where I found my interest in optics. I’ve been an optician in Australia for 12 years and loved every minute! We have a daughter who is a very talented and accomplished musician in Australia. As she wanted to pursue her passion for music in the USA, we decided to move to California. I was fortunate enough to come across Insight Vision Optometry. The Dr’s and team are motivated, professional, and genuinely caring for their patients and I knew this is where I wanted to be. I grew up in Southern California before moving to the Pacific Northwest where I spent seven years in Portland, Oregon. While living in Portland, I explored my interests in visual arts and fashion design. I became interested in eyewear after discovering I had a slight astigmatism in both eyes during a routine eye exam that resulted in my doctor suggesting I get a pair of glasses. I chose a beautifully crafted handmade frame and immediately fell in love with wearing glasses as a fashion statement. Not only did I love my glasses aesthetically, but I was also thrilled that my astigmatism was corrected and I could see the world so much sharper through my camera lens! It was at that moment I decided I wanted to learn more about the world of eyewear and optometry. Shortly after I started working for a local optometry practice where I had the opportunity to aid patients in filling their prescription and helped choose the perfect frame for their style; ensuring they too could see the world crystal clear. 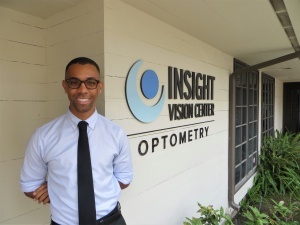 When I moved home to SoCal I was lucky enough to have discovered Insight Vision Center where I am currently continuing my journey into the fascinating world of optometry! What I love most about my job is that I get to help change people’s lives tremendously! Your eyes are precious and being able to see well is extremely important. I also absolutely love working with Dr. Mai and Dr. Lam because they are both extremely loving people who go above and beyond in their work and care deeply for their patients and staff. As an undergrad at UC San Diego, I explored many career fields, but found myself very intrigued by the health care professions. At my very first annual eye exam I had the opportunity to really gain a full understanding of what the field of optometry is. My doctor at the time really loved what she did and it was very apparent. I attended UCSD with the intention of completing requirements for optometry school. I had an incredibly fulfilling experience in college as I was very involved in student affairs, volunteered, and shadowed an optometrist all while completing my degree in General Biology. My path took me into an initial career in Higher Education, but most recently I decided to venture back to my initial goal of working in the optometry field. Insight Vision Center has provided me the incredible opportunity to fully appreciate and continue my journey to my ultimate career goal of becoming an optometrist myself one day. It is an incredible feeling coming to work knowing you will make a difference in the way someone sees the world. I love that Dr. Mai, Dr. Lam, and the staff genuinely love what they do and are always making sure expectations are exceeded with every patient that walks through the door. My journey to Insight Vision Center Optometry has been an exciting and unexpected one. I graduated from the University of Arizona with two bachelor’s degrees – one in Religious Studies and one in Communication. I moved after finishing college from my hometown Gilbert, AZ to the big city: Los Angeles. For a year I interned with an Asian American Christian Organization where I worked with college students. After that, I decided to take a leap of faith and step out into the workforce, with the same passion and desire to help people in a tangible way. The years before coming to Insight, I dabbled in restaurant business, caregiving, and eventually found myself working at a Lasik eye center where I first gained exposure to the world of optometry. It was there that I gained a great appreciation for clear vision and also wanted others to experience the same thing. 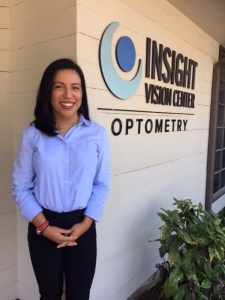 A year after working there, I was blessed with the opportunity to join the Insight Vision Center team where I am continuing to learn more about optometry and vision therapy. Coming here has helped me to discover my passion for vision therapy. I love being able to work closely with our patients, playing games and doing fun activities that are actually helping them improve their vision. I look forward to learning, growing, and helping people improve their eyesight so they can love the way they see! I love going into work knowing that I am playing a part in helping someone improve the way they see. Dr. Mai, Dr. Lam and all the staff members are driven by their desire to put the patient first, and it is evident in the way they work, interact, and care for them. I love coming into work knowing that each day will be different, filled with various wins and challenges. I’m so thankful for my team and Insight Vision Center! It is a fun and exciting place to work at and I am looking forward to growing with this team! I graduated UCLA with a double major in Biology and Asian Humanities. My journey began my first year of college when I went to Honduras as a Global Brigadier. On the trip, I instantly clicked with the work of a vision clinic. I was astonished at the impact a simple donation of glasses could have on a person’s day to day life. From then on, I immersed myself in vision research at my university as well as several more clinical trips abroad in Mexico and an eventual East-West medical internship in China. With my opportunities at my university and abroad, I was able to build a strong passion and understanding in vision care in a clinical and global environment. 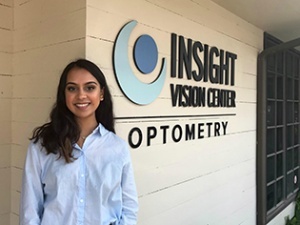 I hope to bring my experience to an eventual career in optometry, and that is why I am an intern at Insight Vision Center. I love the work environment at Insight Vision center because the staff is very passionate about giving the best vision care, and they are very willing to go the extra mile to make sure that patients are happy and satisfied with their experience. Dr. Lam and Dr. Mai are very knowledgeable mentors and they helped me learn and get the most out of my internship! I started off my college career as a piano performance major which gave me the opportunity to teach piano at a local piano school. It was here that I realized how much I love working with kids and having the opportunity to benefit a person’s life. Although teaching has been a rewarding experience, I still felt motivated to be able to do more for people. It was this motivation that guided me to pursue a biology degree, which I am currently working on at Cal State Fullerton. After shadowing doctors and learning more about the field of optometry through the CSUF pre-optometry club, I realized that optometry was the right fit for me. Becoming involved in the pre-optometry club, as well as being an executive board member, gave me the opportunity to meet fellow members of the optometry community. 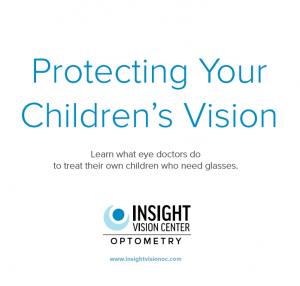 Along with my experience at Insight, I am also working with a nonprofit organization that provides vision services to the underserved community. These experiences taught me how much better you can make someone’s life by giving them the gift of better vision. I love how caring and passionate everyone is at Insight Vision Center. Dr. Mai and Dr. Lam are some of the most kind-hearted people I have ever met with an incredible amount of knowledge and an endless desire to be of service. I also love that we are a family friendly office and I get to work with kids of all ages! Born and raised in the South Bay, I was charmed by the diversity of my neighbors and the experiences this area provided. The love I had for the people around me was inspiration to give back to my community in the best way I could. Growing up, I felt proper healthcare was a necessity for every person. Therefore, I majored in Psychology while attending UCI, which offered the skills to implement positive societal changes through knowledge, empathy, and compassion. I continued to explore other fields in healthcare after graduation, and soon discovered my passion for optometry when I was diagnosed with vitreous humor detachment. This, coupled with my strabismus/amblyopia that I had left untreated since childhood, helped me realize the importance of vision. I felt empowered to help people gain access to proper vision care. Because of its reputation, I decided to work at Insight Vision Center. Here, I get to experience the dedication the doctors and staff display for their patients with the same goals as my own. I feel blessed to be involved with the Insight team and directly help our community for the better! I am so proud to say that patients of all ages and backgrounds can feel confident with our care. By the end of the appointment, patients will leave knowing they are being guided towards the treatments and opportunities that are best for them! Learn More How Our Optometry Team Can Help You. Contact Us, Today! Our team of professional eye doctors and friendly staff are here to care for all of your vision needs. Give us a call at (714) 486-3315 or click here to schedule your consultation with one of our eye doctors. We are always eager to help! Insight Vision Center Optometry serves Costa Mesa CA, Irvine CA, Newport Beach CA, Santa Ana CA and Huntington Beach CA.